Employees and Contractors and Tax Forms, Oh My! I t’s that time of the year again in the U.S. where employers and companies need to file tax forms for their employees and contractors. January 31 is the deadline for you to send your labor force any relevant tax forms they need to complete their taxes. But it can get so dang confusing about who gets what, when, where and why? I’m no tax expert, but I’ve been doing this long enough to know just enough to make me dangerous. It’s always best to consult your tax advisor, but I’m 98.9656932% this information is correct. Whenever you hire a contractor or employee for the first time, make them fill out a W9 and send to you. Keep this information for your records as it has their tax ID number and filing status. Regardless of their company filing status (i.e. corporation, LLC, partnership, or sole proprietor), you need to get a W9 from them. Likewise, when you are hired by a company or individual who plans to write off their payment to you as an expense, make sure you give them a current W9. The two main forms due by January 31 are the 1099’s (specifically 1099-MISC) and the W2’s. In short: you send W2’s to your employees and 1099’s to your contractors. The hard part comes in determining which contractors. For the 2012 tax year (and for the past few years actually) you only need to send 1099’s to contractors to whom you paid $600 or more. (I trust you have some kind of accounting or bookkeeping program that keeps track of this information.) If you ARE a contractor who’s been paid $600 or more by someone in the tax year, make sure you get your 1099’s from them by January 31. You do NOT need to send a 1099 to corporations (S-Corporations or C-corporations). If you are a corporation, you do not need to worry about getting a 1099. LLCs are a little mor complicated. If you are an LLC that does business as a corporation (i.e. 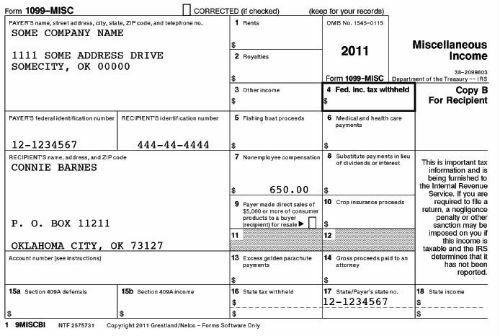 the W9 you filled out was marked “LLC filing as a Corporation”) then you do not need to get a 1099. If you’re an LLC filing as a partnership or sole proprietor, then you DO need to file a 1099. So, if you’ve hired LLCs in 2012, make sure you find out their filing status. (Ideally, you would have received a W9 from them when you first hired them, and that form would have the filing status). January 31 is just the deadline for you to send a 1099 to your contractors. But you still need to file those 1099’s with the IRS too. The deadline for you to file with the IRS (specifically Copy A of the 1099-MISC form) is February 28, 2013 (April 1 if you file electronically). Every year I pay $39 to use Intuit’s 1099 eFile Service to file my 1099’s with the government electronically. It’s totally worth it to avoid the hassle of doing it myself. They’ll generate the 1099’s for you to send to your contractors and electronically file the correct forms with the IRS. For more information on this topic, read this IRS web page (it’s also a great antidote for insomnia). Problems is, I paid my contractor with PayPal. Any idea what I need to do now? I’ve seen that too. Seems like you need to exclude that contractor from your 1099 run.